The fortieth episode of Kingdom Hearts Union is back with the after party of the 10th anniversary special. Join Branden, Jackie and myself as we discuss the sales figure for Kingdom Hearts 3D in Japan, the release dates of both North America and Europe, as well as a game breaking glitch in the game. We then move on to a series of Burning Questions regarding the development of Kingdom Hearts 3 (or lack of) or if we wanted a new team to work on it. Hit the jump to see what else this podcast covers! During the Nintendo Direct live stream conference, Nintendo has confirmed that the European released date for Kingdom Hearts 3D is July 20, 2012! Included in the stream is the first English footage of the game! Hit the jump to watch it! Nintendo announced during their Nintendo Direct livestream event that the Nintendo 3DS will receive a software update which will add the ability to make folders. 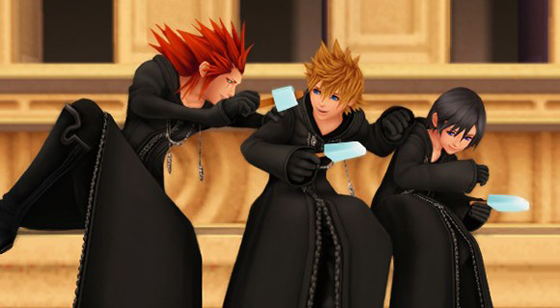 Included in that update is a patch for Kingdom Hearts 3D. Details about the patch are unknown but hopefully it will fix the game breaking bugs the game currently has. The update will arrive on April 25th. The official soundtrack to Kingdom Hearts 3D has been released in Japan! The soundtrack was once again composed by Yoko Shimomura but she also had the help from Takeharu Ishimoto (The World Ends With You), and Tsuyoshi Sekito (The 3rd Birthday).The three disc soundtrack can still be bought by those who aren’t in Japan. Hit the jump to find out where! Square Enix E-Store’s official twitter account has tweeted the cover image of the Kingdom Hearts 358/2 Days manga volume 4. The manga will go on sale on April 21 2012 in Japan and hit the jump to view the cover!